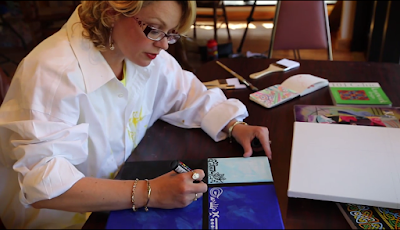 If you are interested in boosting your creativity, want to learn to paint like the Modern Masters, or want to immerse yourself in abstract and contemporary art, then this class is for you. I have uploaded my list of resources (art supplies, books, videos, etc.) to help students who want to dig even deeper in their artistic explorations. You can find that list here. I'm a little bit behind on my sketches for #the100dayproject on Instagram. The project began last Tuesday, April 19, and ends in July 27. 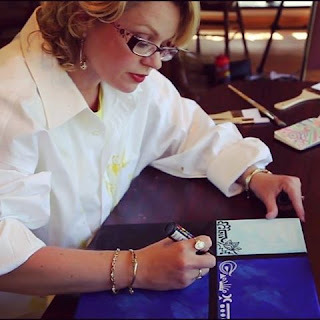 Artists who have participated in the challenge in the past encouraged me with their stories of personal growth stemming from the consistent, daily discipline of art creation. Here's a confession: I can't believe I actually decided to commit to this challenge. 100 days? That's a lot of artwork! Here are my first few days of #100LittleInspirations. I completed them on black archival tiled paper and used Sakura Gellyroll pens. I hope you are enjoying this challenge, as well. If you are looking for a bit of inspiration from a contemporary working artist, then sign up for updates from Erik Davis' beautiful blog. You can also visit his Facebook page. Here is Erik's energetic painting for Earth Day earlier this month. Erik's lush and explosive colors make him one of my favorite artists working today. In fact, I'll have some of his original art to offer as a giveaway soon in an upcoming workshop when I launch my newest Skillshare class. Did someone say, "new art class?" Because that's all I've been thinking about lately! I will announce this class very, very soon. Then, my Skillshare students will have a workshop, and before you know it, I'll work to post the next class (which will be on Miro'). Starting today, Tuesday, April 19, through Wednesday, July 27, artists all over the world will begin posting their first drawings, paintings, or illustrations for a 100 day challenge on Instagram. You can find these posts by searching for the hashtag: #the100dayproject on Instagram. 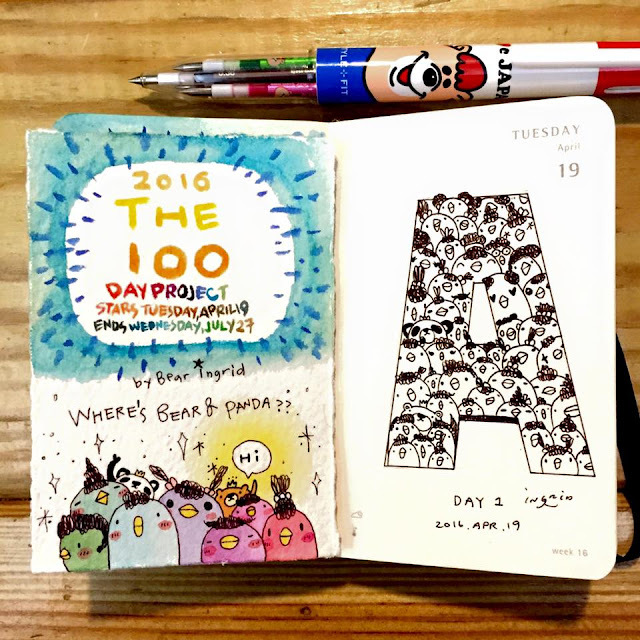 Artists are encouraged to use the hashtag #the100dayproject in addition to making their own hashtag. Today, I began my first in a series of sketches I will complete for the challenge. They are called #100DaysOfLittleInspirations. 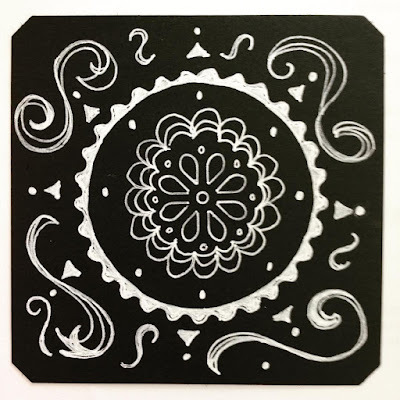 It's exciting to have the opportunity to sketch toward a goal of deepening my potential visual ideas for my Art-o-mat series, Little Inspirations. It's also exciting to be working simultaneously with artists from all over the globe. There are even art instructors from Skillshare participating, including Elle Lune and Ria Sharon. Eventually the ideas you have in your head come out in your sketchbook. 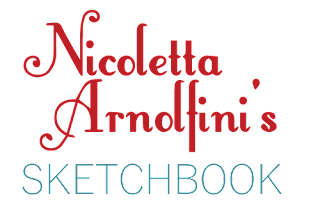 From the sketchbook, you will translate and develop your strongest, best, and most significantly personal ideas in your paintings. If you need a reason to jumpstart your creativity, work quickly through lots of potential compositions, and join an artistic community dedicated to the same goal, then I encourage you to carve out a few minutes to sketch today and each of the next 99 days. I look forward to seeing you along the way. Happy art-making! 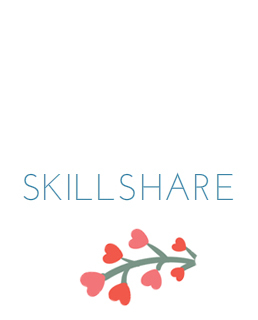 I can't wait to publish my new class on Skillshare, which is currently in video production and editing mode. This next class will be on Mondrian and will impose a creative restraint: a limited color palette of up to three colors. I will complete a painting using acrylics and introduce new techniques, art supplies, and resources. 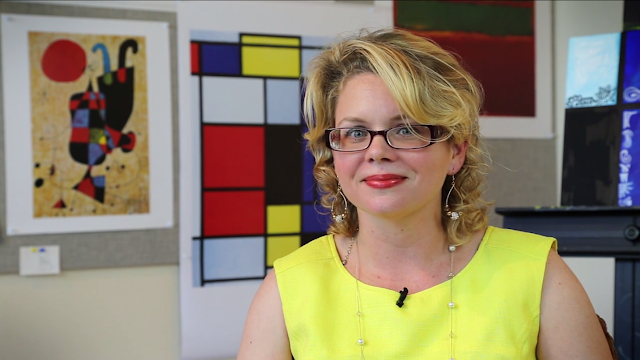 An AMA (Ask Me Anything session) and a workshop encompassing both the new Mondrian class and the Kandinsky class will quickly follow the debut. I'm so excited about starting a new artistic adventure together with my outstanding students. Be on the lookout for the class by the end of this month. Last night, my students posted their final projects in my two week abstract art challenge on Skillshare. This means that today is a very difficult day because I have to choose the winners for the giveaway prizes in my class. I appreciate the contribution of each student in my class, and I will blog about their efforts more in the near future. Sookie Sachs wins the survey giveaway of original, handpainted watercolor art by Australian Brooke Wong. 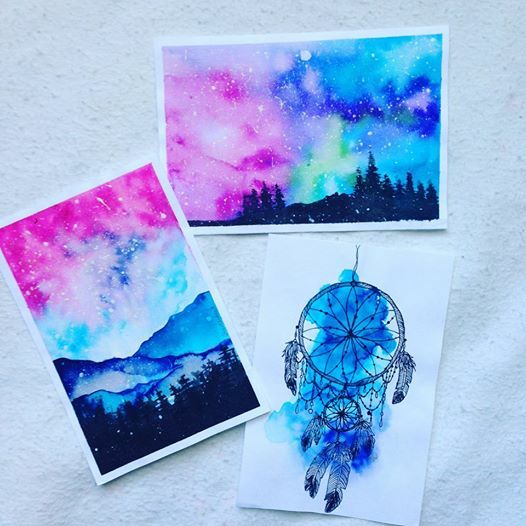 Under the name @artbybee7, Brooke has a beautiful Instagram account as well as a YouTube channel where she posts her speed paintings. Rebecca Vadnie wins the original drawing by New York contemporary artist Ilan Leas. Fie_ wins the t-shirt by Austin, TX, artist Sophie Roach. To learn more about Ilan and Sophie's work, please check out this blog post. Carella Herberger wins the Art-o-carton prize with ten original pieces of art by ten Art-o-mat artists. There are such gorgeous works in this box. 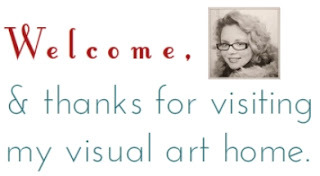 You can learn more about the individual artists here. 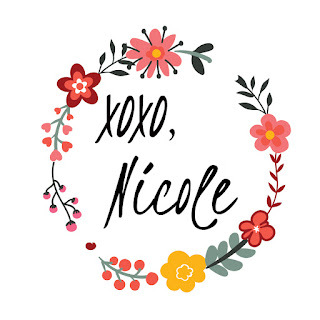 Winners, please send me an email at nicolettaarnolfini@gmail.com with the address at which you want to receive your giveaways. Thank you, again, to everyone who participated. Each participant added so much to my class. 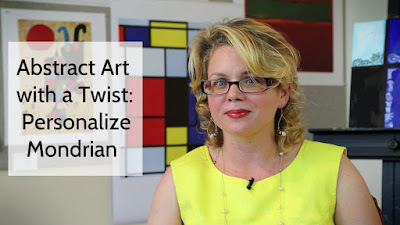 Stay on the lookout for my next class (on Mondrian) to debut at the end of this month! When I hold a two-week workshop in conjunction with my Skillshare Abstract Art class, I complete a painting along with my students. I do this because there is always something new to learn. One of my favorite things about teaching these workshops is the free flow exchange of ideas. All of the participants learn from each other and take that knowledge back to their individual projects. Here is my latest painting, completed alongside my students in the workshop that ends tonight at midnight. I started this project earlier this month, and here is my progress at that time. First, I painted the white square canvas with IRIDESCENT WHITE in Liquitex heavy body acrylic paint (because every girl loves sparkles). Then, I painted an outer circle in (my new favorite color) LIGHT BLUE PERMANENT, again in Liquitex heavy body acrylic paint. I used loose strokes around a central circle (similar to an individual Kandinsky square/circle from our class reference painting). 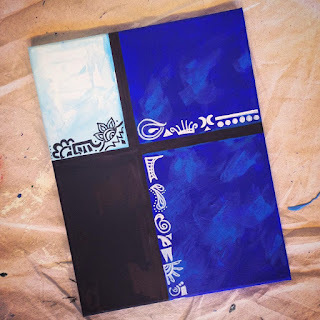 Next, I painted a darker blue circle in the middle, using BRILLIANT BLUE, again in Liquitex heavy body paints. I have been listening to the same song a lot lately, in order to stay in the same mood when working on this painting: Nils Lofgren's BLACK BOOKS. Previously, I told the workshop participants that I am trying to re-create the "electric rain" sound that the guitarist makes toward the last 1/3 of the song. Somehow a blue and orange color scheme worked mentally to accomplish this. We'll soon see if I am satisifed with the result. Here is my finished painting below, pictured with some supplies. You can see my burlap and my grate stencils below. I red, orange, and some light orange Uni-Posca paint markers to complete the top layer of designs. I'm naming this painting Electric Tears, after the Buckethead album of the same name. I would like to paint this again, but use a lighter background. I feel my blue background (in the middle) is still too mid-range and could have been lighter. The lesson here is that you never know until you try. Remember that when you are nearing the final stages of your painting, you can easily be paralyzed with fear. It's easy to worry, "What if I do something wrong?" You can overcome that fear by telling yourself to ask yourself this instead, "What if I DON'T do something RIGHT?" You will never learn if you don't push your creative horizons. Often, this is just a matter of doing the work. As Piet Mondrian said so often that it became his motto, "Always forward." I hope that today, you push your creative horizons just a little bit farther. 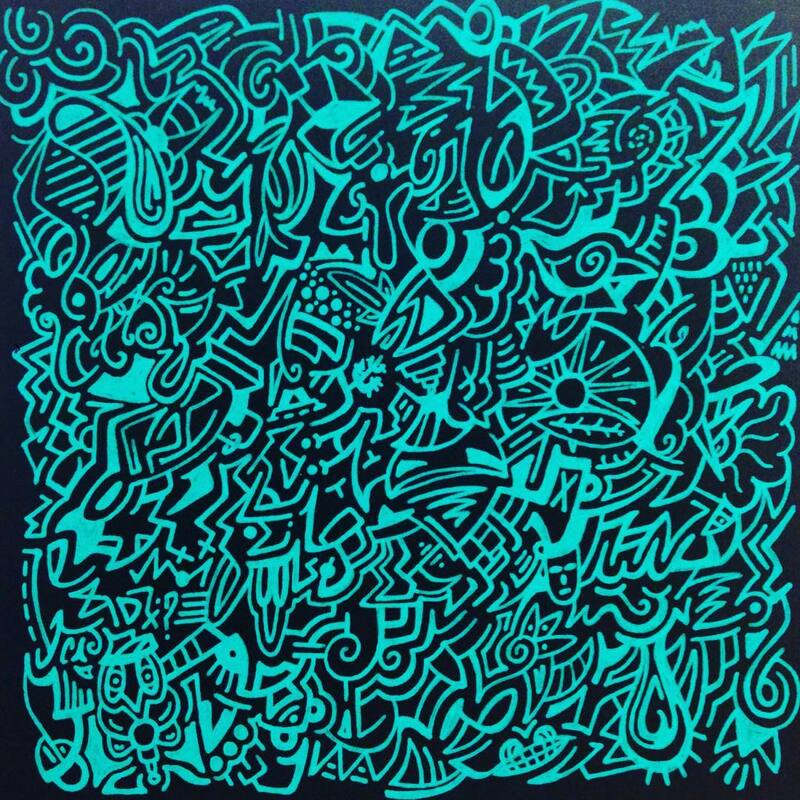 Abstract Art Symbols: What Do You See? 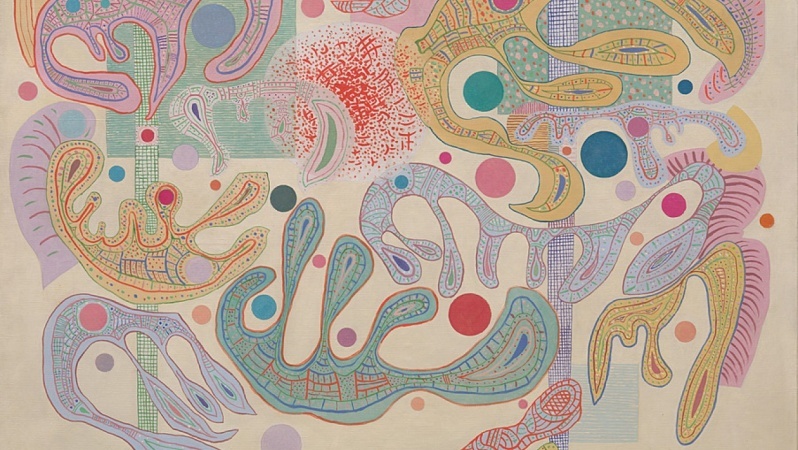 Udeshi identified with the biological shapes in Kandinsky's Capricious Forms from 1937, seen below. The amoeba-like subject matter dovetails with Udeshi's desire to communicate relaxing and organic themes. To achieve the proper mood while painting, Udeshi listens to Erik Satie's Gymnopedie no. 1. Rebecca viewed the same reference work as a springboard for her "little blob creatures" in her sketchbook. Her painting (beside the sketchbook, pictured below) reflects the playful movement that Kandinsky captured in his work. 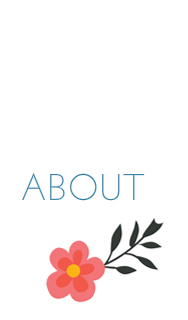 Students on Skillshare can have private accounts, so you may not be able to see Sara's project. 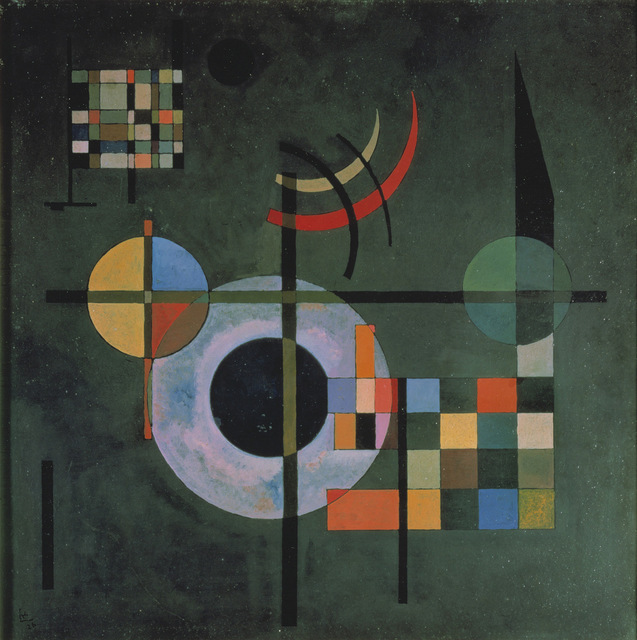 I wanted to share with you some observations, however, from a reference work she chose: Kandinsky's Counterweights (1926). Counterweights communicates gravity from its perpendicular lines and balanced proportions. I seem to see a modified Japanese torii image between the second and third circles in the above painting. These gates offer protection and divide the sacred from the profane. 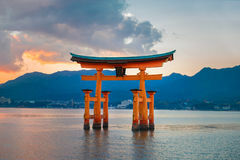 Now, I have no evidence that Kandinsky intentionally meant to introduce this symbol, but I often think I see the torii image in his work. 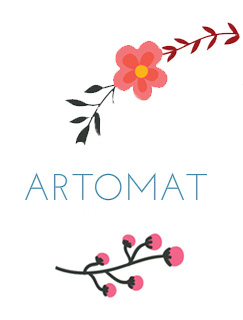 I like to break down individual elements from Kandinsky's paintings for my Art-o-mat work. You can see what I call his "torii image" on the top row, second mini-painting. You can also see in the bottom row, little "aliens," that I find in other paintings by Kandinsky. One of the reasons I really like Kandinsky is that you never stop finding exciting new things to explore in his rich and diverse subject matter. 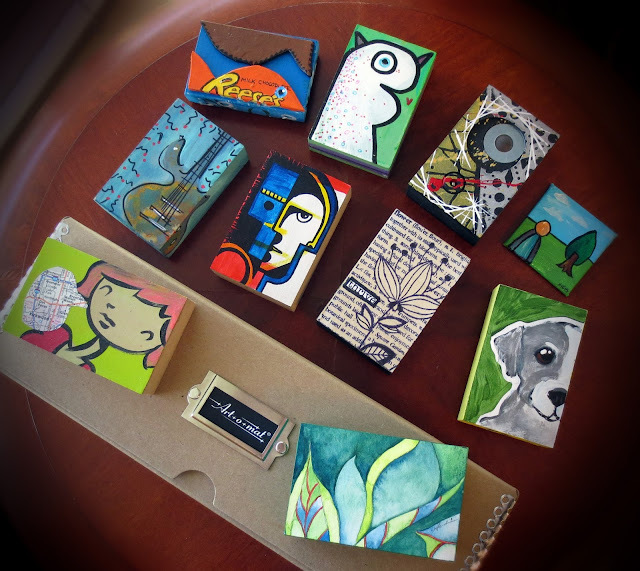 Contemporary artists like those represented in our workshop giveaway art (Ilan Leas, Sophie Roach, and our Art-o-carton creators) migrate toward symbols in their work. Whether it's nature, cuneiform, street art, or geometry, each artist starts with a visual seed and nourishes that vision until it becomes a painting. What symbols will resonate with you today? What will you create? I compiled these resources below so you can bookmark this blog post for future exploration. 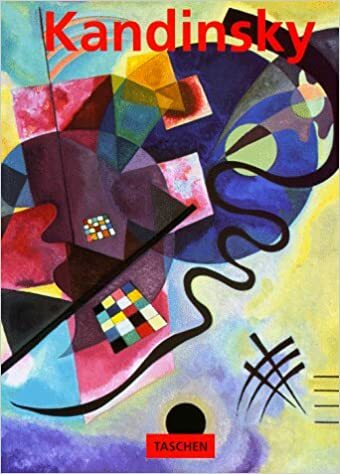 This book by Hajo Dutching has page after page of full-color paintings by Kandinsky. In paperback, it's a nice, lightweight, inexpensive book to take with you when you need to spend a night sketching in a cafe. The beautiful, illustrated pages inspire every time I open the volume. Especially at the used price on Amazon, this book will only add value to your sketchwork. 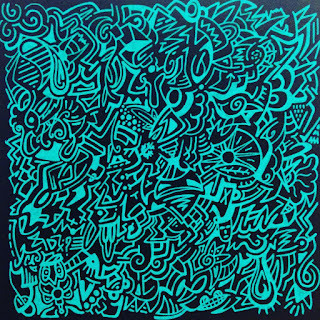 If you enjoy podcasts, check out Modern Art Notes. 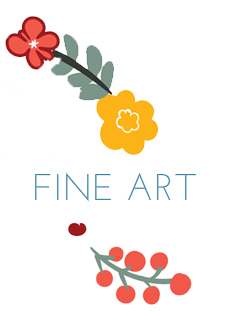 The actual link to a podcast about the beginnings of abstract art is here. This podcast was produced to compliment this exhibition at the Museum of Modern Art in 2012. Kandinsky's book called Concerning the Spiritual in Art explores the how he believed that art could improve humanity. Although many assume that Kandinsky and his contemporary, Picasso, used similar styles, they did not. (They also had very distinct personalities.) Picasso wanted to deconstruct representative images, and he achieved fame with his ground-breaking Cubism. 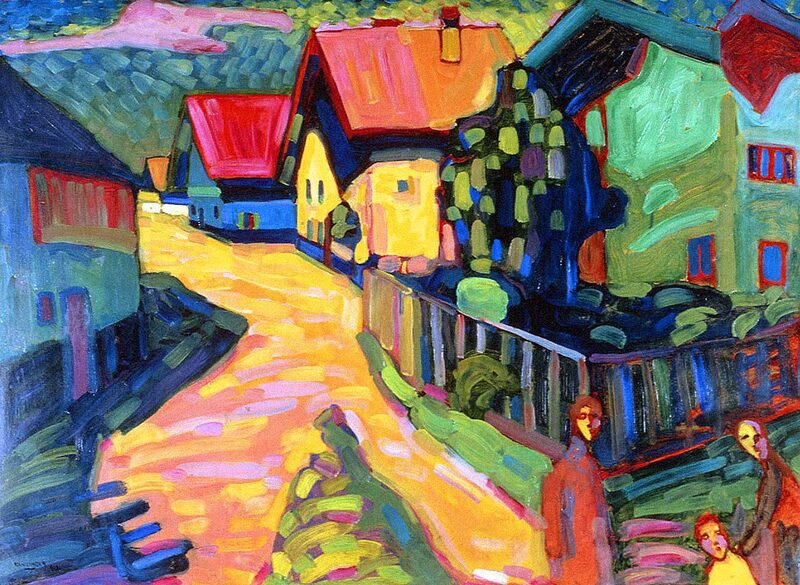 Kandinsky wanted to start from nothing and build up from there. You can listen to the book as you paint by checking out this itunes podcast link. Amazon also carries the book if you prefer the non-audio version.